Register Now for this FREE High Content Teleseminar! We have had a lot of buzz about the release of The Renaissance of Exercise: A Vitruvian Adventure, which we released last week. In fact, many people are raving about the value and content of the FREE bonuses. Steve Scott said, “The talk on registering performance is incredible”. With all of the great feedback and comments about the textbook we wanted to give you a behind the scenes look to what went into the creation of the textbook and the evolution of RenEx. 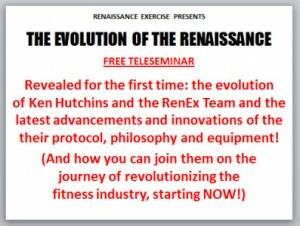 Therefore, Ken and the RenEx Team have agreed to do a LIVE FREE HIGH CONTENT TRAINING Teleseminar this Wednesday, December 21, 2011. Ken and the team will also be discussing some new innovations in the protocol that you can only hear about on this call! This is one call you won’t want to miss. We look forward to speaking with you on Wednesday! P.S. Don’t miss this one time HIGH CONTENT call, which will allow you to immediately take what you learn and put it into action. So don’t miss out! REGISTER ABOVE! P.P.S. 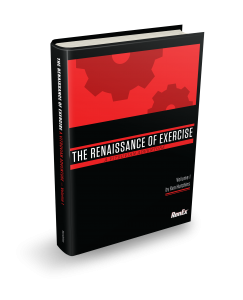 If you are interested in ordering your copy of The Renaissance of Exercise: A Vitruvian Adventure be sure to do so before Friday as we are shutting it down to service those who have already ordered. We only have a limited number of books and when they are gone they are gone. Don’t get left out! CLICK HERE TO ORDER YOUR TEXTBOOK! I’ve just finished listening to the teleseminar and wanted to say that I continue to be extraordinarily impressed with the level of articulation the RenEx team is able to provide when they get together. Great talk guys, can’t wait for what’s next! RenEx guys … great job with the teleseminar. I learned so much from it that I could put it to use with my clients today. My wife suprised me and ordered the book for me, even though I was told to wait until next month : – )! I ‘m looking forward to adding it to my first Super Slow Protocol Manual (ordered it in 1993). Due to unexpected holiday visitors, I missed the teleconference. I apologize for that. Is there any possibility you could make the teleconference recordings accessible to folks like me?? Is the Austin location going to be an Overload facility? working on getting the recording of the radio show. no, the Austion location is not ours.